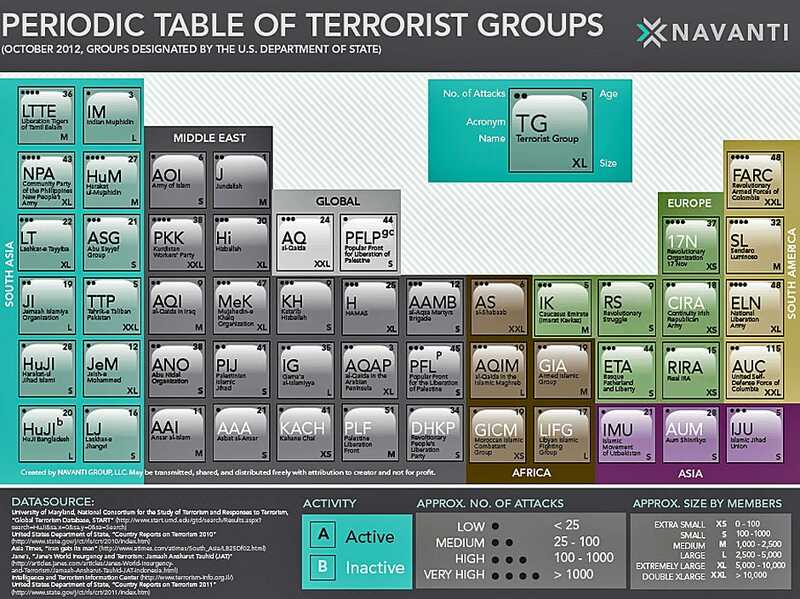 The Department of State currently labels 52 groups as Foreign Terrorist organisations (FTOs), and strategic communications firm Navanti has put together a handy graphic to illustrate America’s view of the global terror threat. • In September the Iranian opposition group Mujahedeen Khalq (M.E.K), or People’s Mujahedeen, successfully lobbied to be removed from the FTO list. In April Philip Hersch of The New Yorker reported that U.S. Joint Special Operations Command (JSOC) trained members of M.E.K. in communications, cryptography, small-unit tactics and weaponry at a secretive Nevada site from 2005 to at least 2007. • Chris Hedges — the main plaintiff in the lawsuit challenging the indefinite detention provisions contained in the 2012 National defence Authorization Act (NDAA) — says he has “had direct contact with … 17 organisations” considered FTOs. Hedges (along with other journalists and activists) are suing the government because that section of the 2012 NDAA — which gives the president the authority to detain anyone who provides “substantial support” to the Taliban, al-Qaeda or “associated forces” — is vague and doesn not include a provision to exempt journalists from being indefinitely detained. • Joby Warrick of the Washington Post reports that Hezbollah has recently been linked to two high-profile operations — a surveillance mission in Cyprus and the July bombing in Bulgaria that killed five Israelis — that indicate the Iranian proxy group’s increasingly global reach. All-in-all, the graphic is a helpful representation of organisations the U.S. government currently considers as enemies in the never-ending war on terror.